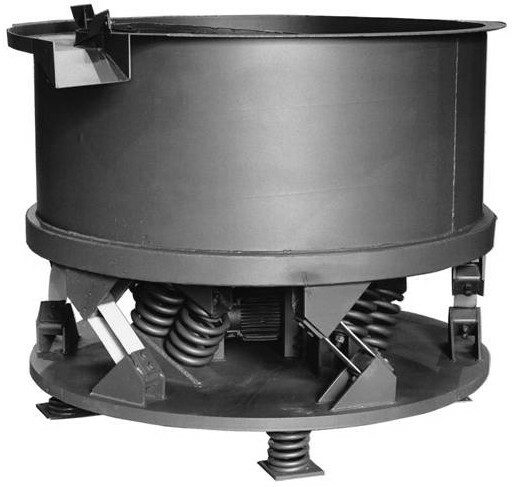 Beginning around 1960, the quest to equal or exceed the performance of an Electro-Magnetic Feeder prompted the inception of the most modern version of the Electrically Controlled, Electro-Mechanical type of Vibrating Feeder. At that time, many unsolved field problems with the newly conceived “Induced Vertical Flow” kind of Vibratory Machines caused their basic mathematics to be changed to vector equations in hopes of pinpointing the difficulties. This precipitated the formulation of the vectorial “Drive vs. Load” analysis for a vibratory machine in 1964. Eventually, from this different analytical approach came the discovery of an A.C. Squirrel Cage motor rotating relatively small eccentric weights, combined with “sub-resonant” tuned “stiff” drive springs to possess a full range of adjustable output by simply varying the voltage of its power supply. It was 1965 and this simple method of electrical control made the Electro-Mechanical Vibratory Feeder both viable and practical. As the record shows, it met with immediate success and still leads all the other kinds of Electro-Mechanical Feeders available today. The only difference is the “VFD”, which varies the frequency (hertz), is now the preferred type of full range, zero to maximum, output adjustment that is manual or automatic. World’s Largest Feeder – When needed, longer Feeders are available. This one is 32 ft. (9.8 m). It requires 10 HP (7.5 kW). The Kinergy Vibrating Feeder, featuring the Kinergy Drive System, controls the rate of flow of bulk solids from storage in the same way a valve adjusts the flow of liquids. More specifically, a smooth, full range of adjustment from zero to the maximum amount output in infinite steps! While feeding functions can be achieved with Belts, Aprons, Skip Hoists, and Tramways, only Kinergy’s “Electro-Mechanical” Vibrating Feeders provide the full range of zero to maximum TPH rate adjustment of the bulk solid being fed. Just as the valve does for liquids! Changing the cluster of steel coil springs from being concentrated in one place to being spread or distributed across the width and along the length, larger size Feeders were possible. Today the largest Vibrating Feeders ever built are routinely provided by Kinergy. Our Vibrating Feeders are the most energy efficient, require minimal maintenance, operate very quietly, and have an electrically adjustable feed rate. When combining these features, Kinergy Feeders obtain the best performance level possible! Thus, the simple design and best performance rating makes the Kinergy Vibrating Feeder the number one choice in Vibrating Feeders. Durability: Kinergy Vibrating Feeders are built to last with an average of 20 years or more of productive use. Proven Performance: The simple design and best performance rating make the Kinergy Vibrating Feeder the best choice in Vibrating Feeders. Energy Efficiency: All the Feeders utilize the Kinergy Drive System, which is the most versatile and energy efficient drive available. This drive is a combination of a free force input from an A.C. type electric motor with the output of sub-resonant tuned springs. When the applied load increases, the springs inherently drive harder. It maximizes the use of “Kinergy” which is defined as the kinetic energy developed by a spring’s motion during the drive portion of its cycle. Dust-Tight Construction: Our integral dust-tight design is recommended when dust emissions must be minimized or avoided. 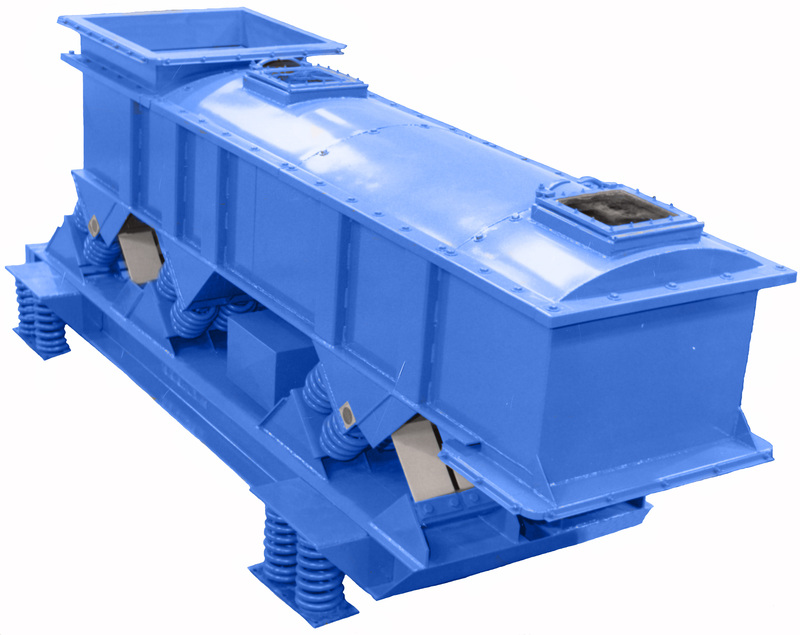 Underside Design: The vibratory drive system is located underneath the feeding trough. This positioning is the most popular one for Kinergy Driven Feeders. Top Drive Design: The drive system is mounted above the feeding trough. This drive arrangement allows the bottom of the Feeder’s conveying trough to be fully accessible for various discharge ports. End Drive Design: The drive system is mounted on either end of the Vibrating Feeder. This positioning has the advantage of a low profile type of design which minimizes head room requirements. Larger Dimensions: Since the Kinergy Drive System spreads or distributes the vibratory, dynamic forces, the diameter or length and width dimensions are not restricted as they would be if concentrated at one point. This is the reason Kinergy Driven Uni-directional Vibrating Feeders are standardized in widths to 18 ft. and lengths as required. Simple Electrical Control: By taking advantage of the inherent adjustable output, the Kinergy Vibrating Feeder can have its operating stroke and frequency automatically and repetitively “pulsed”. The Vibrating Feeder can perform other functions, such as screening, when the electrical pulsing action is used. Reduced Sound Levels: Kinergy Vibrating Feeders operate very smoothly and quietly, typically less than 80 dBA. Low Maintenance: By the use of components specifically designed to endure the vibratory action of the Kinergy Vibrating Feeder, maintenance requirements have been markedly reduced. 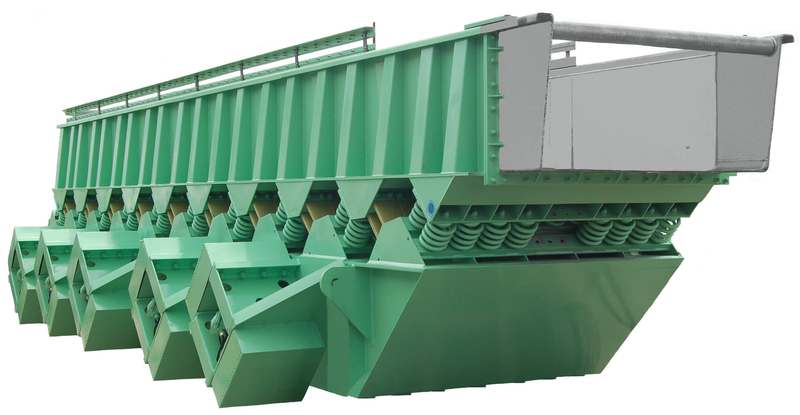 Interchangeable Components: Most of the component parts of the Kinergy Vibrating Feeder are interchangeable with other Kinergy Driven units even though their functions may differ. These common components extend to Screens, Conveyors, Fluid Bed Coolers and Dryers, Spiral Elevators, and the various types of Foundry units. This reduces the number of spare parts required. Counterbalancing: All Kinergy Driven Feeders are Dynamically “Counterbalanced”. This is inherent in their modern design. 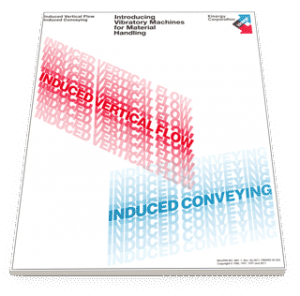 The Kinergy Drive System has proven to be the most versatile and energy efficient vibratory drive known when applied to Induced Conveying machines. This makes Kinergy Vibrating Feeders the optimal choice. To learn more about these innovative machines, please contact Kinergy at 502.366.5685 or download Kinergy’s descriptive Bulletin KDF-1 entitled “Kinergy Driven Vibrating Feeders”.